"Here's what happened in the 2018 Texas primaries" was first published by The Texas Tribune, a nonprofit, nonpartisan media organization that informs Texans — and engages with them — about public policy, politics, government and statewide issues. Before Election Day, a snapshot of the 10 counties in Texas with the highest number of registered voters showed motivated Democrats casting ballots early. But totals in the primaries for U.S. Senate told a different story: More than 1.5 million people voted in the Republican primary, with close to 100 percent reporting, compared to about 1 million Democrats, also with near 100 percent reporting. Abbott went to particularly great lengths to unseat Davis, dumping around a quarter million of his own dollars on the race. Davis led Susanna Dokupil by more than 10 percentage points with almost all precincts reporting Tuesday night. Laura Moser secured a slot in the party’s primary runoff on Tuesday, despite rare attempts by national Democrats to end her bid over concerns she is too liberal for the district. Fletcher led the crowded Democratic field on Tuesday with 30 percent of the vote, and Moser placed second with 24 percent. Whoever makes it out of the runoff will face U.S. Rep. John Culberson, R-Houston, in the fall. This race is one of three in Texas that Democrats are expected to target in hopes of gaining a majority in the U.S. House in 2019. Democratic primary candidate for the 7th Congressional District Laura Moser cheers with supporters at a watch party in Houston in Houston on Mar. 6, 2018. Five of the eight open-seat congressional primary races are headed to runoffs. The other three were decided Tuesday night. 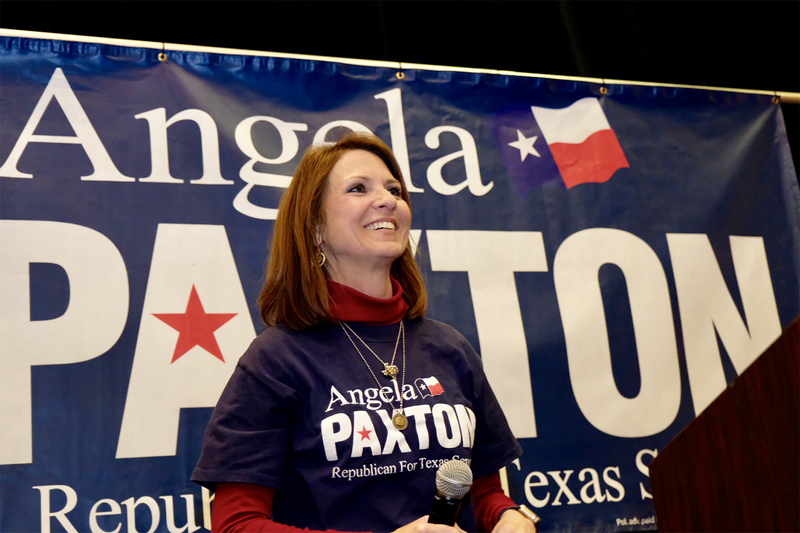 Angela Paxton speaks to her supporters at her primary election night watch party in Allen on Mar. 6, 2018. Here's what happened in the 2018 Texas primaries By Cassandra Pollock March 7, 2018 As polls opened in the Texas primaries on Tuesday, The Texas Tribune laid out seven key questions for election night. Now that the smoke is clearing, here are the answers: Did more Texas Democrats vote than Republicans? In short: No. Before Election Day, a snapshot of the 10 counties in Texas with the highest number of registered voters showed motivated Democrats casting ballots early. But totals in the primaries for U.S. Senate told a different story: More than 1.5 million people voted in the Republican primary, with close to 100 percent reporting, compared to about 1 million Democrats, also with near 100 percent reporting. Gov. Greg Abbott tried to unseat three Republican incumbents. How did they do? State Reps. Sarah Davis of West University Place and Lyle Larson of San Antonio are one step closer to returning to the Texas House in 2019 — despite Abbott making an extraordinary effort to unseat them. Both Republicans won their primaries Tuesday night but face general election challengers. But the governor did prevail in one race: Abbott-backed Mayes Middleton unseated state Rep. Wayne Faircloth of Galveston on Tuesday, edging out the incumbent by roughly 15 percentage points. Abbott went to particularly great lengths to unseat Davis, dumping around a quarter million of his own dollars on the race. Davis led Susanna Dokupil by more than 10 percentage points with almost all precincts reporting Tuesday night. The governor’s 1-for-3 record — and Davis’ explicit shots at Abbott during her victory speech — could color the next legislative session in 2019. What happened in Texas' 7th Congressional District? Laura Moser secured a slot in the party’s primary runoff on Tuesday, despite rare attempts by national Democrats to end her bid over concerns she is too liberal for the district. Moser, a journalist and activist, will face attorney Lizzie Pannill Fletcher in the May 22 runoff — which will likely be a brutal intra-party fight and could divide west Houston and the national Democratic Party. Fletcher led the crowded Democratic field on Tuesday with 30 percent of the vote, and Moser placed second with 24 percent. Whoever makes it out of the runoff will face U.S. Rep. John Culberson, R-Houston, in the fall. This race is one of three in Texas that Democrats are expected to target in hopes of gaining a majority in the U.S. House in 2019. 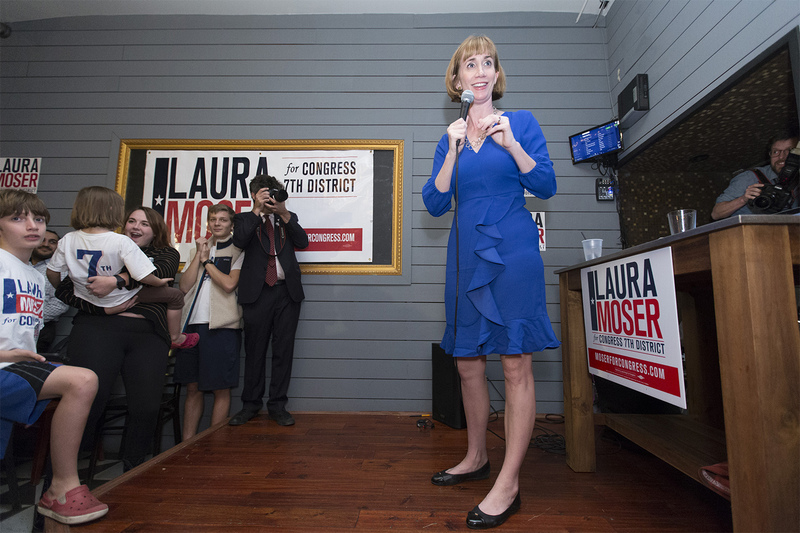 &nbsp; Democratic primary candidate for the 7th Congressional District Laura Moser cheers with supporters at a watch party in Houston in Houston on Mar. 6, 2018. &nbsp; What happened with Texas Land Commissioner George P. Bush's re-election bid? Land Commissioner George P. Bush took a giant step toward serving a second term Tuesday night, winning outright a four-way Republican primary race for the statewide office. Bush — who kept a low profile during the campaign — raked in nearly 58 percent of the vote with around 93 percent of precincts reporting, avoiding a runoff against his predecessor, Jerry Patterson. Patterson came in second with around 30 percent of the vote, with Davey Edwards and Rick Range coming in third and fourth place, respectively. Bush, the nephew of President George W. Bush and son of former Florida Gov. Jeb Bush, will face Democrat Miguel Suazo in a November general election that’s not expected to be competitive. How many primaries for Texas' eight open congressional seats will have to be settled in runoffs? Five of the eight open-seat congressional primary races are headed to runoffs. The other three were decided Tuesday night. State Sen. Van Taylor, R-Plano, easily won the nomination to replace retiring U.S. Rep. Sam Johnson, R-Richardson, and is expected to win the seat in November’s general election. State Sen. Sylvia Garcia, D-Houston, also won her party’s nomination Tuesday for the seat being vacated by U.S. Rep. Gene Green, D-Houston, placing her on track to win in the fall. Veronica Escobar edged out other Democrats in a crowded race for the seat currently occupied by U.S. Rep. Beto O'Rourke, D-El Paso, who is leaving to run for the U.S. Senate. Here’s who’s set for a one-on-one matchup in the remaining races: 2nd Congressional District — Republicans Kevin Roberts, a Houston state representative, and Dan Crenshaw 5th Congressional District — Republicans Lance Gooden and Bunni Pounds 6th Congressional District — Republicans Ron Wright and Jake Ellzey 21st Congressional District — Republicans Chip Roy and Matt McCall 27th Congressional District — Republicans Bech Bruun and Michael Cloud Who came out on top in the expensive North Texas primary battle between Phillip Huffines and Angela Paxton? Paxton beat Huffines on Tuesday by about 10 percentage points in their race for an open state Senate seat. The contest between Paxton, wife of Texas Attorney General Ken Paxton, and Huffines, twin brother of state Sen. Don Huffines, R-Dallas, was the most expensive primary for a state office this year.&nbsp; Angela Paxton speaks to her supporters at her primary election night watch party in Allen on Mar. 6, 2018. Which Democrat is going to run against Abbott? Lupe Valdez, the former Dallas County sheriff, and Andrew White, son of late Gov. Mark White, will duke it out this spring over who will be on the November ballot against Abbott. Both Valdez and White have long been considered likely frontrunners for the nomination. The two stayed far ahead of the other seven Democrats who had lined up to challenge Abbott on Tuesday night, with Valdez leading with around 42 percent and White placing second with roughly 28 percent. Whoever wins the May 22 runoff will face an uphill climb in their efforts to unseat Abbott. He’s the most popular statewide elected official, and he has $41 million in the bank for his re-election bid. Disclosure: Jerry Patterson has been a financial supporter of The Texas Tribune, a nonprofit, nonpartisan news organization that is funded in part by donations from members, foundations and corporate sponsors. Financial supporters play no role in the Tribune's journalism. Find a complete list of them here. Read related Tribune coverage As general election begins, Cruz escalates battle against O'Rourke Texas poised to send its first two Latinas to Congress The 2018 Texas Hotlist: The most competitive races in this year's primaries Despite national Democrats' efforts, Laura Moser makes primary runoff in bid for Houston U.S. House seat "Here's what happened in the 2018 Texas primaries" was first published at by The Texas Tribune, a nonprofit, nonpartisan media organization that informs Texans — and engages with them — about public policy, politics, government and statewide issues. Link back to the original article, which is located at https://www.texastribune.org/2018/03/07/texas-primary-elections-2018/.